These fine robin egg blue mohair pillows have light blue cotton linen backings. The inserts are down and feather fill. Sold as collection of four. Pillow made from a vintage Turkish rug with cotton back. Zipper closure. Age wear. A large pillow made with a brown Turkish Mohair rug. 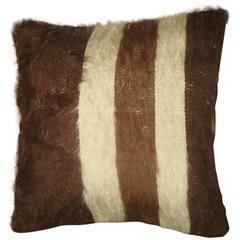 A small pillow made with a brown Turkish Mohair rug. Double-sided Pillow made with a Turkish Mohair rug. A bolster size pillow made from a Turkish Mohair rug. 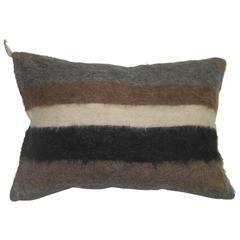 These mohair plain and simple soft pillows are in pristine condition. Sold in pairs and two pairs in stock.